In addition to being an amateur radio operator, I am also a stamp collector or "philatelist" as they say around the Merriam-Webster. Stamps are like high heel shoes ― there are just too many for one girl to collect them all, so stiletto and stamp collectors specialize. On the stiletto front, I only collect high heels to die for and on the stamp front, I collect stamps from the United Nations (among other countries and specialties). Vittoria Schisano (right) in the 2012 Italian film Tutto Tutto Niente. 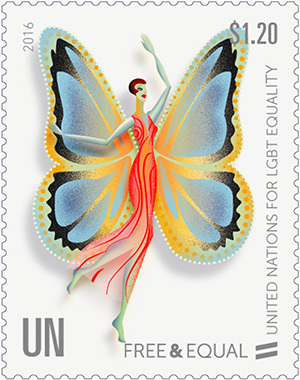 I love the stamp but wonder how many ambassadors in the UN are pleased with the stamp and the stamp series? I am sure they love the revenue it brings in but the subject for so many countries is unacceptable. I love the stamps too but wonder about the topic. Quite a contrast from the German stamps of the 1930's depicting swastikas and images of Hitler.